Episode 78 is Part 2 of our conversation about three Academy Award-nominated films, and it focuses on Call Me By Your Name, a romanticization of predatory sexual relationship. It's visual beauty hides the reality behind the relationship at the heart of the story and the deadly message that sexual experience is the defining element of our lives. Dr. Trotter and Mike Schutt discuss this film and its themes, and they wander into topics of movie-going, thoughtful criticism, and Christian worldview on the way. While the conversation is rated PG-16, you'll be edified by their approach to this movie and films in general. Drew Trotter is the Executive Director of the Consortium of ChristianStudy Centers. He was for twenty-two years the Executive Director and President of the Center for Christian Study in Charlottesville, VA. Drew has written on film and popular culture for over thirty years in such publications as Books & Culture, Christianity Today and Critique, and in the field of Biblical studies. For over twenty years, he has presented a seminar entitled Show and Tell: How to View a Movie Responsibly, helping laypeople and students in churches, Christian college and secular university environments understand this powerful medium and how to think about its influence both on the individual and the society. He has taught seminars on popular culture, university education in America today, a Biblical model of discipleship and how to interpret the Scriptures. Drew has three sons, two daughters-in-law and six grandchildren and lives with his wife of forty-four years, Marie, in Charlottesville, VA.
Mike Schutt is host of the Cross & Gavel Podcast. He is Associate Professor at Regent University School of Law, Director of the Institute for Christian Legal Studies, and director of Law Student Ministries at Christian Legal Society. 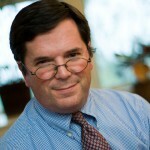 He is the editor in chief of the Journal of Christian Legal Thought and director of the CLS Law School Fellows program. Dr. Drew Trotter, executive director of the Consortium of Christian Study Centers, is a film critic who understands the role that movies play in shaping us as a society. His lecture, The Movies and America: What the Nominees for Best Picture Tell Us About Ourselves, is an annual favorite around the country. In this episode, Dr. Trotter sits down with host Mike Schutt to discuss three of the nominees, including the winner for best picture. In Part one, they discuss Guillermo del Toro's The Shape of Water and Greta Gerwig's Ladybird.